In school, cruel kids nicked her “Crazy Sabine.” However, to Sandrine Bonnaire, the Cesar winning French actress turned documentarian, the brainy, beautiful girl with an infectious smile who motored around independently on a scooter before misdiagnoses and failed treatments found her institutionalized for five years, was always her sister first. In the passionate, understated documentary Her Name Is Sabine, Sandrine Bonnaire, her fellow camerawoman and collaborator Catherine Cabrol, and editor Svetlana Vaynblat create a moving tapestry of more than twenty-five years of footage of the life of now thirty-eight year old Sabine Bonnaire. As the film opens, we catch up with Sabine who is currently living in a loving, supportive environment in France’s Charente region following her release from the institution and shockingly late diagnosis of autism in 2001. Quickly Sandrine discovers that the charming, vivacious and inquisitive girl from her youth is now forever changed with diminished motor and comprehension skills that were no doubt exacerbated by the confinement. Rather than interjecting herself in the film especially in certain heartbreaking scenes which would have been understandable for a relative more than a documentary filmmaker, Sandrine Bonnaire admirably remains an objective witness, participating in events only when she is spoken to directly by Sabine or others as she captures the life of not only her sister but the caring small facility where she resides and the likes of which there are very few in France. While Sandrine Bonnaire’s thesis of analyzing and contrasting Sabine’s diminished faculties following the confinement is illustrated early on, it’s never an argumentative piece and one that in fact could have been far more damning of the system that failed Sandrine’s younger sister. However, instead the Cannes Film Festival Director’s Fortnight winner Her Name Is Sabine unfolds methodically while raising awareness in “a society that still does not know how to properly take care of its citizens with physical and psychological disabilities,” (Film Movement). 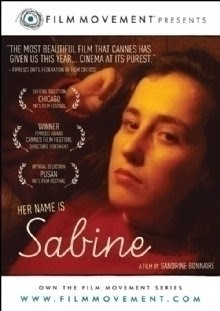 With its painstaking attention to detail evidenced early on by Vaynblat’s sharp editing, Sandrine Bonnaire’s critically acclaimed film festival favorite manages to effectively slow dance back and forth through the twenty-five years of Sabine’s life similar to the way that it’s earliest footage depicts Sandrine dancing with her younger sister Sabine. Despite the fact that this time around, Sandrine must consistently lead, with patience, empathy and understanding, she manages to ensure that Sabine enjoys keeping the beat, even when the tune of the music-- much like life-- changes unpredictably.